"Their greatest challenge lies in rescuing one of their own"
It seems like ever since 2001, firefighters have been in the spotlight. They should have been in the spotlight all along. Firefighters are the ones that run towards the fire, while everybody else runs away from the fires. They have to go through so many things, more than what people know or think what they go through. Ladder 49 will show what fire fighters have to handle with everyday. During the movie, you will follow a fire fighter, Jack Morrison (played by Joaquin Phoenix). 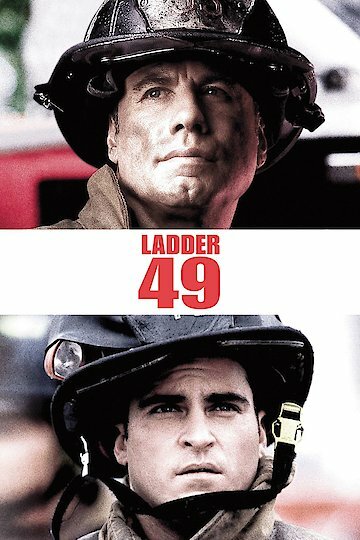 Jack becomes part of the fire station (Ladder 49) under the watchful eye of Captain Mike Kennedy (played by John Travolta.) With the help of Captain Kennedy, Jack becomes a wonderful fire fighter. Along the way, Jack meets a girl and they start dating. They date for some time and then got married and had two children. Jack was having a little bit of trouble with the family because his wife, Linda (played by Jacinda Barrett.) It is not the kind of trouble, which you might be thinking of. It is safety with the job. Linda wants to make sure that Jack is safe at all time because she does not want to lose him to a fire. At the same time, Jack has to juggle both a demanding career and a family. Through the entire film, Jack fights many different types of fires. Each fire is a little bit worse than the last one. Even though Ladder 49 is a great movie for people to watch to know how firefighters live. Even though this is a very serious movie, you will be laughing and crying with everybody else on the screen. You will never know what will happen next, so be prepared to be sitting on the edge of your seat while you are watching this movie, with a box of tissues next to you. Ladder 49 is currently available to watch and stream, buy on demand at Amazon, Vudu, iTunes, YouTube VOD online.